Less than half the internet traffic comes from humans. Bots have taken over the internet. According to the Imperva Incapsula Bot Traffic Report, various bots are now responsible for more than half of all internet traffic around the globe. These bots range in function from systematically posting political messages on Twitter, to scrubbing the internet to fill out your Facebook newsfeed. Even more, a majority of the bots are considered “bad bots” which are designed to mimic websites to steal user identities, capture ad revenue, or even cripple sites by overwhelming them with fake traffic (DDoS attacks), among other nefarious tasks. The report estimates that businesses lose an estimated $7 billion dollars each year thanks to ad fraud perpetuated by this nasty software. 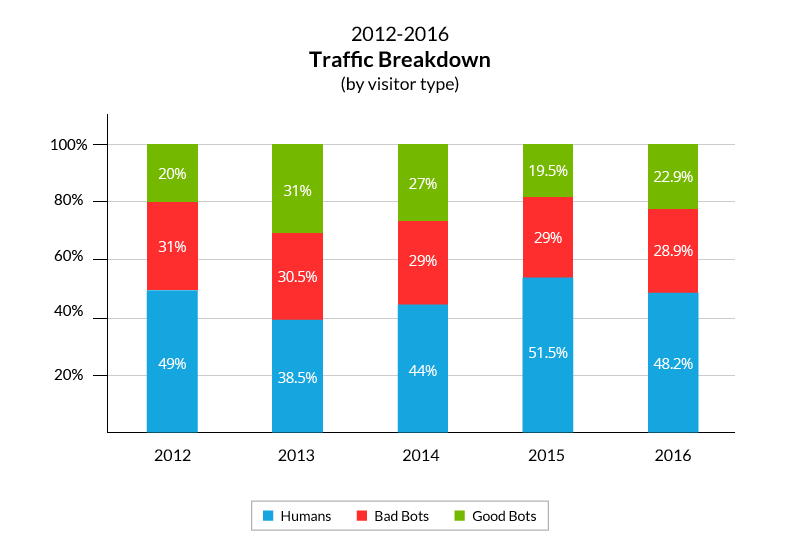 However, while the bad bots are still in the majority, their numbers seem to remain stagnant while more “good bots” are being created. Good bots are responsible for monitoring and enhancing your browsing experience. These bots help populate your feeds and cast a wide net for your search engine queries. Efforts to lessen the impact of bad bots are extensive. Aside from the measures ad agencies employ to limit the damage they are capable of, laws are also being enacted to mitigate bot activity. Last year the Better Online Ticket Sales (BOTS) Act became law, making it illegal for bots to be used to unfairly snag up tickets to high demand events, in hopes of reselling them to make a large profit.